Simple, real ingredients. Simple, quick preparation. Life is busy and sometimes complicated, but mealtime doesn’t have to be. Chickapea Mac & Cheese pairs their simple, two-ingredient pasta with a clean, organic cheese sauce for an easy, nutritious meal the whole family will enjoy. Chickapea Mac & Cheese is not just better for you, it’s actually good for you! Yes, Chickapea Mac & Cheese actually tastes good! It’s creamy, cheesy, easy peasy – everything you love in a good mac & cheese, without the weird, unpronounceable ingredients or carb crash. 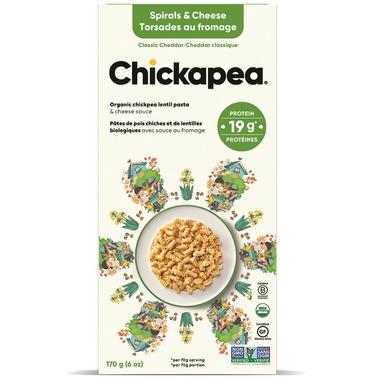 With 19g of protein and 8g of fibre per serving, it’s a complete and healthy meal. No longer do you need to sacrifice your health or feel guilty for enjoying your favourite comfort food. Go ahead, eat the whole box! Pasta - only 2 ingredients! Organic Cheddar Seasoning: Organic Cheddar Cheese, Organic Milk, Cultures, Salt, Enzymes, disodium phosphate, Organic Whey, Organic Buttermilk, Organic Nonfat Milk, Salt, Organic annatto extract. Made in a facility free of crustaceans & shell fish, gluten, egg, nuts, soy, peanuts, fish, mustard, celery. I donâ€™t like leaving negative reviews, especially as I like this brands pasta products, but this product is frankly disgusting. I couldnâ€™t figure out why my kids werenâ€™t eating it, as they love a similar brand, and took a bite - I immediately understood. Itâ€™s really not nice tasting at all. Pretty disappointed as it seemed like it was going to be a great product! Really good! Flavours tasted natural. Like this one better then the macaroni noodles and orange cheddar by the same brand. I really like this! It's a healthier way to enjoy boxed mac & cheese, although still pretty high in calories. It tastes really good. I'd definitely buy again!